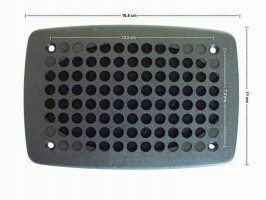 2X NEW BLACK LOUDSPEAKER + GRILL WITH 20 WATT 4 Ohm OUTPUT. THIS UNIVERSAL SPEAKER AND GRILL IS PERFECT FOR CARS FROM THE LATE 70s TO 80s. CAN BE MOUNTED ON THE REAR PARCEL SHELF, DOOR CARDS, DASH OR IN THE SIDE FOOT WELLS. 5 CM DEPTH MAKES THEM IDEAL FOR A CENTRE CONSOLE ALSO. VERY WELL SUITED TO BLAUPUNKT RADIOS OF THE ERA FOR THAT CONSISTENT FACTORY FITTED LOOK. CLASSIC TWO PIN DIN SPEAKER PLUG WHICH CONNECTS TO THE SPADE/PIN SPEAKER INPUTS ON MOST MID 70S & 80S CAR RADIOS. THIS LISTING IS FOR A SINGLE PLUG..